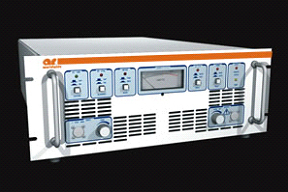 Manufactured by AR Modular RF, model KAW2180 is a Class A wideband RF power amplifier delivering in excess of 100 Watts CW power into a 50-Ohm load over the frequency range of 10 kHz to 1000 MHz. Manufactured by AR Modular RF, model KAW2180 is a Class A wideband RF power amplifier delivering in excess of 100 Watts CW power into a 50-Ohm load over the frequency range of 10 kHz to 1000 MHz. Power gain is a minimum of 50 dB. GPIB control requires the optional IEEE488.2/RS232 Interface Controller Module. The system features forward and reflected power indication on a front panel-mounted, analog meter; Automatic Level Control (ALC); RF gain control; overdrive protection; full VSWR protection; input blanking, and over-temperature protection. On the basic model these features, plus remote power on/off control, are accessible for hard-wire remote operation through a 25-pin, Dsubminiature connector. For a detailed description of these features refer to “SPECIAL FEATURES – 2- BAND RF POWER AMPLIFIERS”. The Model KAW2180 is a 19-inch rack-mount unit, 8¾ inches high and 26½ inches deep. Construction is completely modular; all subassemblies are readily removable. Forced-air cooling is by a highly reliable, tube-axial fan mounted on the rear panel. The amplifier operates from 95-132 or 187-265 VAC, 47-63 Hz line. The system may be placed in 'stand-by' mode with the BLANKING switch, which greatly reduces energy consumption and heat generation.